Review written by and copyright: Eric Cotenas (31st January 2019). Still a struggling artist at thirty-seven, Vincent Van Gogh ('s Willem Dafoe), following an episode we will return to later in the film with a far different interpretation even before the "truth" of it is revealed, he feels excluded by the community of artists who did not deign to take part in what was meant to be a group exhibition at a local cafeteria (his own "ugly" artwork filling the walls in their place and putting off the owner who cuts the exhibition short after a day). Painter Paul Gauguin (Ex Machina's Oscar Isaac) similarly feels alienated from a group who act like bureaucrats and seek to impose not only their organization but their acceptance of certain schools and theories upon others. Van Gogh confesses that he feels stifled by Paris and its cold light, so Gauguin – bucking the curve by planning to go to Madagascar rather than currently en vogue Japan – advises Van Gogh to go south. With the financial arrangements of his art dealer brother Theo (Homeland's Rupert Friend), Van Vogh settles in Arles and believes that he has found his light and sees endless possibilities in its flat landscapes. His singular vision in depicting nature draws as much derision from the locals as it did in the city, and his run-in with some mischievous schoolchildren (including a physical attack on a boy) ends up with him being beaten by adults that come to the child's rescue and taken to a sanitarium rather than a hospital after reports of his alcoholic rages. His brother Theo comes to the rescue, but their once very close sibling relationship clearly taxes family man Theo who instead arranges for Gauguin to visit and keep Van Gogh company for a monthly payment of two-hundred-and-fifty francs and a painting per month for him to sell. Although Van Gogh values Gauguin's company, they clash in temperaments, sociability, their sources of inspiration, and their approaches to painting (Gauguin's careful planning versus Van Gogh's frenzied search for the literal "stroke of genius"). When Gauguin attains notoriety in the city and announces his plans to leave, Van Gogh blacks out on the particulars of their fallout but his attempt to repent for his behavior by cutting off his ear as a present for his friend leads to his voluntary admittance to St. Remy's under the advice of sympathetic doctor Gachet (The Blue Room's Mathieu Amalric) where he is assured that he will be allowed to paint. Although confined physically, Van Gogh's imagination opens up and his attempts to "show what I see to my human brothers who can't see it" arouses curiosity and then to fame; however, he continues to doubt his abilities and his attempt to return to nature to replenish his source of inspiration contributes further to his deterioration. Like most biopics on artist Vincent Van Gogh – among them Vincente Minnelli's Lust for Life, Maurice Pialat's Van Gogh, and Robert Altman's Vincent & Theo – At Eternity's Gate focuses on the tormented final months of his short life; however, the gimmick of this version is that it is a film about a painter made by a painter, and co-writer/co-editor/director Julian Schanbel (Before Night Falls) and the film's awards-baiting campaign are quick to point out that the film is not intended to be a "forensic biography" but a visualization of his sensory experiences as an artist tormented by inner demons and outer insecurities based on his published letters to his brother, "common agreement about events in his life that present as facts, hearsay, and moments that are just plain invented" according to the ad copy. Told with fragmented editing and almost monotonously repetitive scenes of Dafoe's Van Gogh swooning in nature, the visuals of concocted by Schabel and cinematographer Benoît Delhomme (The Scent of Green Papaya) – underscored by the sort of minimalist piano soundtrack by Tatiana Lisovkaia that would set Philip Glass' teeth on edge – run the gamut from flat head-on close-ups of others from Van Gogh's POV and chest-mounted POV shots (either streaked with lens flare or smudged along the bottom half) to handheld documentary-esque tracking the artist through nature and resorting to shooting the tedium of the artists' process from unconventional low angles. Visually, the film is at its best when it tries to illustrate observations about Van Gogh's art such as recollected words of Gauguin comparing the surface of Van Gogh's paintings to clay leading to an infrared sequence draining the color of a painting to highlight its textures against its real background where the filter's turning the sky black makes the trees also seem to stand out in relief, or zooms back from extreme close-ups of details from the works of Diego Velázquez, Francisco Goya, Eugène Delacroix, and Frans Hals almost comparing their fine brushstrokes to those writ large by Van Gogh. Dramatically, the film falls flat, squandering both intriguing characters and fine supporting performers. Despite the impact he supposedly made, Gauguin here is deployed rather functionally with Isaac's American accent distracting in a manner untrue of Dafoe's, while the closeness of Vincent and Theo is only hinted at but more understandably underplayed as Theo's once comforting and supportive words about his brother's abilities are difficult for Van Gogh to distinguish in their sincerity whether they might be predicated on profit or simply that of a family member obligated to be supportive. Friend is thus required to give a very restrained and even flat delivery, but Amalric, Anatomy of Hell's Amira Casar as Theo's wife, Venus in Fur's Emmanuelle Seigner as proprietress of the Café de la Gare, Queen Margot's Vincent Perez as the asylum director, and A Prophet's Niels Arestrup as a madman are just wasted. It would be easy to claim nepotism in the casting of Schabel's daughter Stella in the role of barmaid Gaby but she gives an excellent understated performance in a single early scene while her father entirely elides the scene in which Van Gogh gave her his ear to give to Gauguin; indeed, Schnabel also does not show the act of self-mutilation, leaving it to one of Van Gogh's fade to black blackouts. The only actor other than Dafoe who even qualifies as more than a supporting character (even if he might have more than qualified for a supporting actor award) is Mads Mikkelsen (Valhalla Rising) as a provincial (in all sense of the word) priest sent to assess Van Gogh in light of a petition signed by the people of Arles who at first scoffs at the notion that Van Gogh's "unpleasant" paintings are a God-given gift. The priest's internal struggle to both mull over Van Gogh's points while maintaining his position is nicely conveyed in this single scene shot largely in one extended take; however, it is all in the editorial service of supporting the conviction that it was a gift given before its time "life is for sowing, but the harvest is not yet here" for the eyes of people not yet born and that his madness is born of it. While painter Schnabel may be satisfied with that thesis, the affectations of his aesthetic realization of it may not satisfy the curious who are not as steeped in Van Gogh's biography and his surviving published letters as another painter. Shot on Red cameras with Kowa anamorphic lenses, At Eternity's Gate boasts great textural detail in close-ups of the artwork and the features of Dafoe's face while so many other shots and close-ups of other actors are occluded by lens flare and deliberate smudging of parts of the filter in front of the lens perhaps meant to symbolize Van Gogh's feelings of disconnection from other people other than a few head-on conversations. The colors contrast rich warm sunlight and lamplight and cool blues and greys, looking quite apart from the more desaturated color corrected look of contemporary films (including some period pieces). The DTS-HD Master Audio 5.1 track is very front-oriented with pointed use of the surrounds, although the sparseness of the sound design draws attention to the retained sound effects and dialogue levels in exchanges that are echoed in Van Gogh's head (seeming more like clumsy thriftiness in copying patches of dialgoue and effects over rather than emphasizing the any notion that Van Gogh's aural senses are as highly acute as the visual). Optional English, English SDH, and Spanish subtitle are provided (the former two translating some French but occasionally transcribing some obvious words like "oui"). Extras start off with a mutual back-patting audio commentary by co-writer/co-director/co-editor Julian Schnabel and co-editor/co-writer Louise Kugelberg, the director's girlfriend an accomplished interior and architectural designer in her own right, in which they lay out the concepts behind their visual, aural, and editing choices in trying to use cinematic language and tools to embody Van Gogh's psychological and physiological interior. They discuss some of the filmmaking homages, their extensive research and attempts not only to use authentic historical locations but also to find out which Van Gogh paintings would have been created and present in which historical events, as well as the use of English language amidst the French to denote the brotherly bonds of Van Gogh and Theo, Van Gogh and Gauguin, and a few other characters with which he achieves some sort of connection however momentary. They also reveal that Isaac's French was not so fine that they invited Louis Garrel (The Dreamers) over to their apartment to loop Isaac's French dialogue using an iPhone for the ADR recording. There are also a trio of disposable featurettes (7:01) with "Made by a Painter" (2:37) highlighting the film about a painter being the brainchild of Schnabel, "Channeling Van Gogh" (2:16) presumably put together before Dafoe's Oscar nomination, highlighting instead his winning the Volpi Cup, and "Visualizing Van Gogh" (2:09) focusing on the photography. Besides the film's theatrical trailer (2:31), there are also start-up trailers for two other pieces of schmaltzy awards bait: Five Feet Apart in which starcrossed lovers are thwarted by cystic fibrosis, and Ben is Back where Julia Roberts combats her son's drug addiction with tough love. 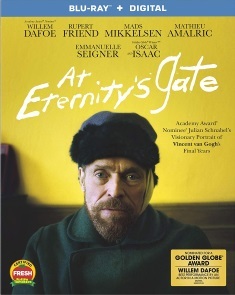 A film about a painter made by a painter who regards too much factual content as "forensic biography," At Eternity's Gate may be more satisfying to those who presuppose a film is a work of art based on its pedigree and its how economically it meets the requisites of festival fodder.